Sweet Georgia Yarns Fibre Club is a fun way to experiment with fibres and colours. It’s also a great way to boot you out of any kind of a fibre/spinning rut you may be in. You sign up for three months at a time. Once a month you get a 100g bag of unspun fibre with a description of the content of the yarn along with some spinning suggestions. The fibre for February is called Candygram. According to Felicia Lo, “All these saccharine pinks, lilacs, light lime greens and pale blues remind me of those little candy hearts that you get at Valentine’s Day.” And boy, she’s right. These are not colours that would have every chosen for myself. But that’s the fun thing about the Fibre Club. Once you have them, you have to work with them. And it ended up being really fun. I love these intense bold colours and the splash of silver glitter that ekes out one in a while. It is made of 63% Superwash Merino Wool, 20% Silk, 15% Nylon, 2% “Silver.” And it was prepared as a pencil roving. A sleek amount of fibre, about the thickness of a . . . pencil. I’ve been off spinning with my wheel due to a spinning injury, and since the spinning workshop last week, I’ve been full on with my spindles. So this is being done entirely with my lace-weight spindles for the singles, and my heavier, Henry’s Dervish for plying. I actually have crafted a detailed plan for spinning this yarn. But I won’t explain my thinking until I am sure it worked. Why bother otherwise? But here it is nearly done – all the fibre is spun up and I am at the plying stage now. From left to right you will see, a larger spindle that I am using for plying with about a third of the plying done. 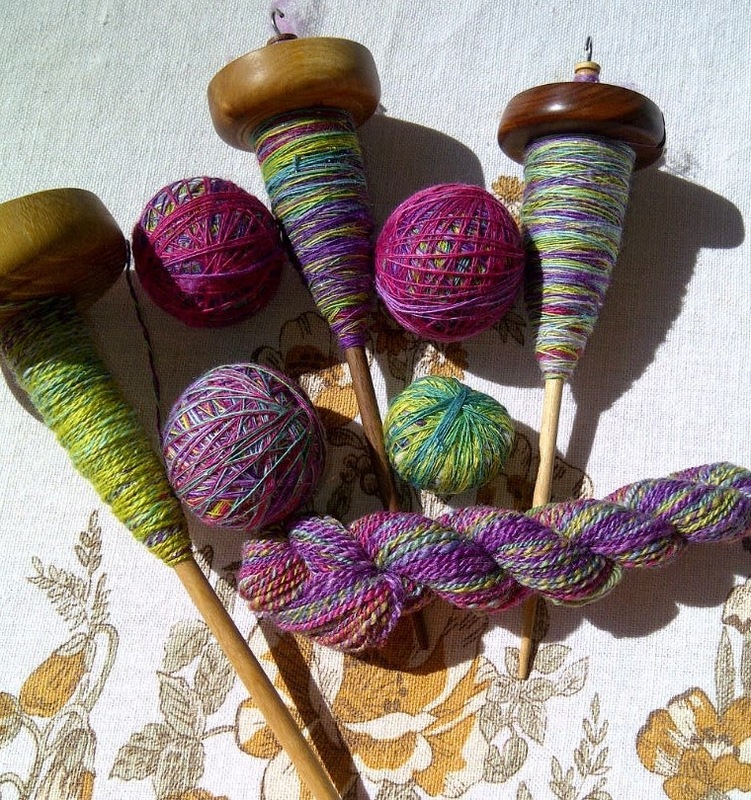 Next to that you will see two sets of purple balls next to lace-weight spindles full of singles. These are waiting to be wound into two-ply balls which make plying so much easier. The wee green ball at the bottom is the left over from winding a double-ply ball. I am sure there will be others so this one will get incorporated into the final plan. The mini skein at the very bottom is one of the sample I did as I tried to figure out how to get the best out of all these colours. Will post the final results. 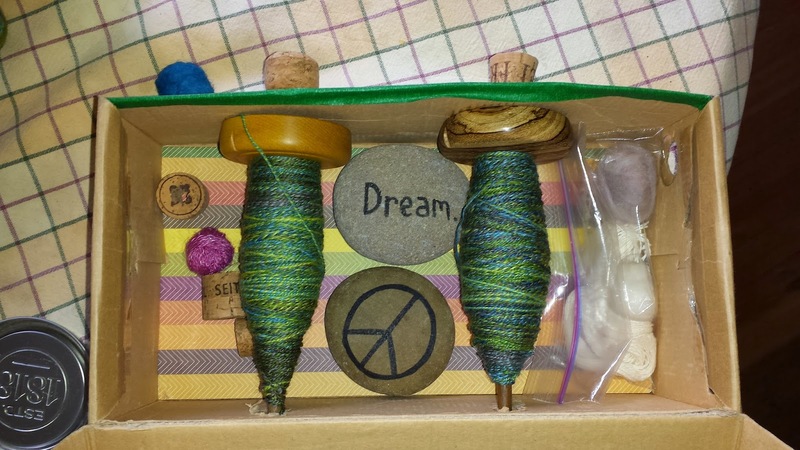 This entry was posted in drop spinning, fibre club, Houndesign, Sweet Georgia Yarns on March 31, 2013 by DianaTwiss. 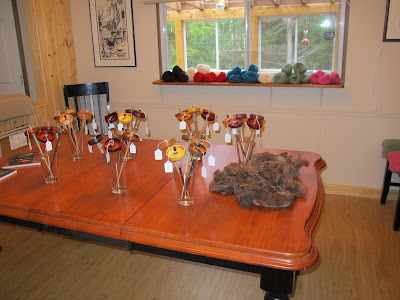 Last Friday I took a whirlwind trip to Haida Gwaii to do a 2-day spinning workshop. It was heavenly. On Friday, loaded down with three suitcases and a huge purse, I flew from Vancouver to Sandspit — a mere 1 hour 39 minute flight. Beng, the organizer of the arts event met me at the airport along with her lovely daughter. We drove to the ferry, crossed over and then drove to Tlell. I stayed at the Toad Farm Guesthouse. A newly renovated home — and I had it all to myself! All my meals were prepared by my host and hostess and served in the main house. After I got unpacked and set up for the workshops the next day, I grabbed my bottle of chilling white wine and headed over to meet everyone. Dinner was divine — roast chicken, potatoes, gravy, salad. I don’t tend to eat much before I fly, so by this time, I was ravenous. Well fed, and full of wine and good stories, I headed back to the guesthouse relatively early as I still had things to set up for the next day. Despite my excitement about the upcoming workshops, I slept like the dead. Must be the air over there. I was up early the next morning and took a walk to the shoreline to see the waves crashing in. There was weather coming in so the water was rough and the waves huge. It was also the only place where I could get cell reception. I didn’t much mind that overall, it’s nice to take a break from the blackberry. But I did want to check in with hubby and see how things were at home. Folks started arriving at 9am and we learned about spindles and spinning until they couldn’t take it anymore, around 4pm. Of the thirteen participants, about eight were beginning spinners. Five of them were absolute beginners. By the end of the day, everyone could spin a continuous thread and was able to make a 2-ply yarn. That’s a lot of learning. The spindles are Henry’s Dervish by Houndesign. The fibre along the window sill is strips of drum carded batts. There was lots of other fibres used in this workshop and the one the next day, but they are all on the sideboard, out of scope of this photo. C’est domage. In the evening of the first day, we hosted a Spin-In for anyone and everyone. One of the participants is a Haida weaver and she showed me how they make warp yarns by thigh spinning. Mostly folks hung out, spun a bit, talked about fibre and such. I got things ready for the next day. The workshop the next day had nine participants. They were more advanced spinners, or people who had taken the workshop the day before. Again, we did an overview of spinning and plying techniques, but on this day in addition to the wide variety of wool fibres, we also played with mohair, silk and alpaca. We made blends: wool/mohair; wool/silk; alpaca/silk and so forth. 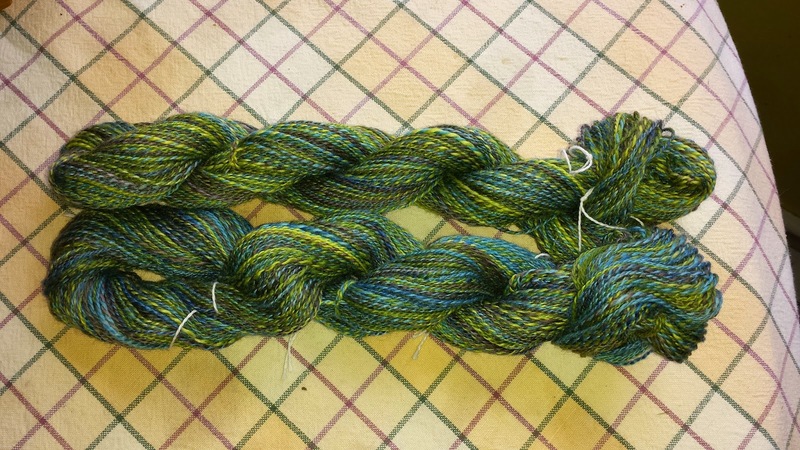 It was a good exercise in blending fibres and also seeing how the addition of another fibre impacts the yarn. After that we learned about cabled yarns and each person made a 4-ply cabled yarn using 4 different fibres or colours. By this time everyone was tired and nearly spun out. But we had one more activity: I brought silk caps for us to play with. For those who have never spun with silk caps, it is a crazy fun thing to do as you open it up, peel apart one of the layers, stretch it out and then get down to spinning some amazingly strong and fine thread. Here’s my piece — this is a lace weight spindle made from Cocobolo. 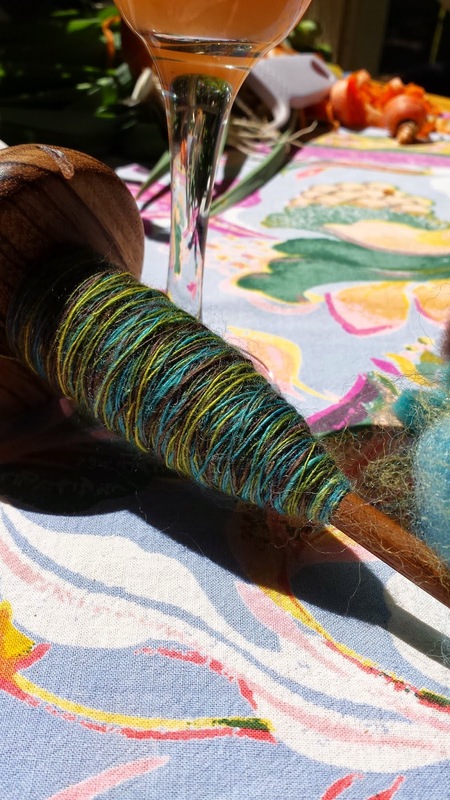 The spindle is a gem and the thread is a terrific colour. I am going to try spinning it a bit thicker and then using it to ply with a wool single or some other fibre. Mix it up a bit. Have some fun. That was an action packed, fibre filled two days. The next day we went to Port Clements and took a wee walk along the Golden Spruce Trail to see where the mighty tree once stood. Then a dash to the ferry and I was on my way home again. The best part of the trip was without a doubt the wonderful people. I made new friends and saw old acquaintances from my workshop two years earlier. It was a lot of work to organize, but I’d do it again in a heartbeat. Just have to figure out what to do next. . . .
A special thanks to Beng for organizing the event; Keith and Elizabeth at Toad Farm for their warmth and hospitality; David and Cheri for providing me with high quality spindles for the workshops; Felicia at Sweet Georgia Yarns for the specially dyed Falklands wool and other fibre braids; Humming Bee Farm for the corriedale and yearling mohair; Kim from Claddagh Fibre Arts for the alpaca, silk and terrific idea to dye and use silk caps; and all the spinners who came and added to the day. I hope to see you soon. This entry was posted in Claddagh Fibre Arts, drop spinning, Houndesign, Humming Bee Farm, Sweet Georgia Yarns, Toad Farm on May 19, 2012 by DianaTwiss.